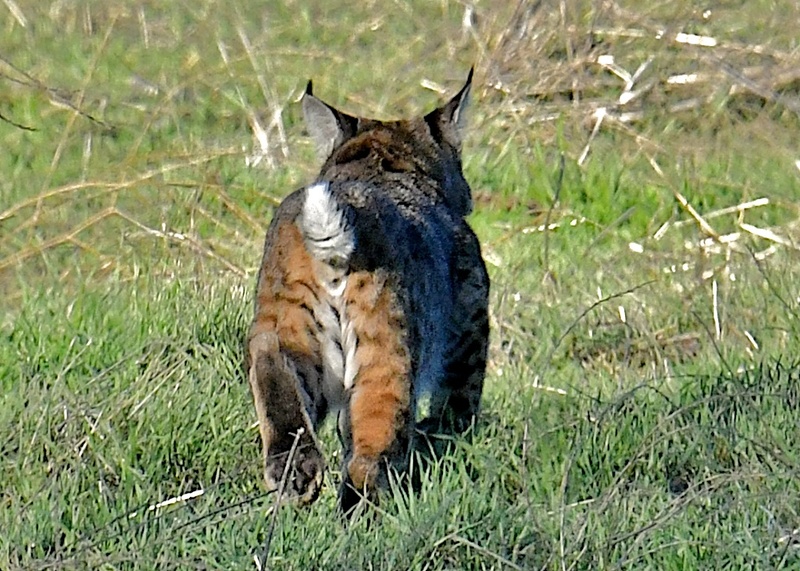 This site has several times previously featured a bobcat area east of Pinnacles National Park in Central California; this posting updates that site. Basically this still seems a very reliable site, though I suspect winter is the best time. The so-called “Airline Highway” (Highway 25) runs north-south from Hollister past the east entrance to Pinnacles National Park. I saw two bobcats in three hours in this area, late afternoon, mid-December, 2016. From the park road, continue south on 25 about a mile and a half, turning left onto the access road to Old Hernandez Road. Very soon the road splits. The left fork goes back north and is marked Willow Creek Road. The right fork (usually better) is Old Hernandez Road and follows the San Andreas Fault north past ranches (east of highway) and scrubby oak (west). That road deadends after 5 miles in a private ranch. I saw a bobcat on the Willow Creek branch about two miles from the “Y” with Old Hernandez; it was sitting in a rough field 50 meters from the road. When I pulled over for photos, it walked off; blowing on a wounded rabbit lure made it pause briefly and then it kept going— I am not sure if I know how to use this device correctly. A better area may be the southerly leg of Old Hernandez. Return to Highway 25 and go south a few miles to a sharp bend in the road. Highway 25 bends right and Coalinga Road (smaller) goes left, parallel to the direction you’ve been going in. Take that. After another few miles Old Hernandez Road goes left off of Coalinga, heading back N up the San Andreas Fault rift. The sign says the road ends in 9 miles; it felt sooner than that to me but I did not measure it. There is a “road closed” sign at a wash0ut by a stream crossing; I turned around here. I had a second bobcat cross the road halfway between the entrance at Coalinga and the end of the road at the river crossing. 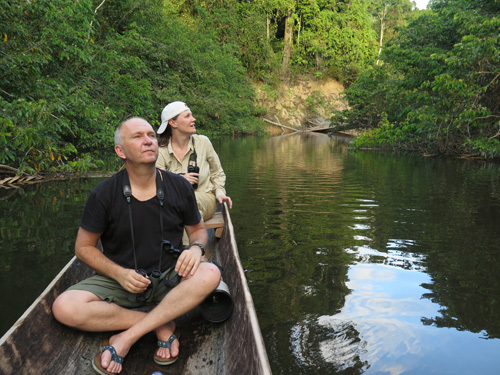 I was alone and a second observer would have helped; it would be easy to miss things here it felt like. 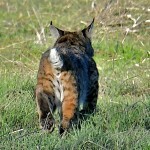 Camping at Pinnacles would increase your odds of success, since bobcats have been seen there too. Introduced turkeys were abundant and I saw one golden eagle and no condors. By way of clarification, Old Hernandez Road can actually be driven from Highway 25 straight through to Coalinga Road, as long as your car can handle the washed out creek crossing (all 4WD and most 2WD vehicles should be fine, most of the year). There are many private property signs, but those refer to the ranches on the sides of the road–the road remains public access (I asked a rancher at Frusetta Ranch–where the large private property signs are–while driving through once, and he said the whole road was fine to drive, just don’t wander off!). The “road closed” sign was placed by San Benito County a few years ago when the creek crossing was washed out and in much worse shape than it is now. I suspect the county placed it as they didn’t have the funds to fix the ford and didn’t want to run into legal issues if someone got hurt or messed up their car out there. Old Hernandez Road, in my experience is almost always better than Willow Creek Road. I agree a second observer is typically very helpful and winter (Nov-Mar) is by far the best time. 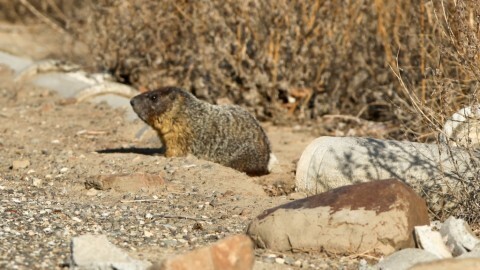 If you spend the night in the area, Heermann’s K-rats are currently abundant along Lonoak Road and Narrow-faced K-rats are possible along La Gloria Road, West of Parks Valley. 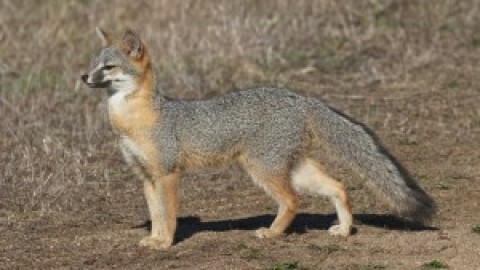 Old Coalinga Road up to the Laguna Mountain BLM area is good for Bobcat during the day; at night, look for Gray Fox, California Pocket Mouse, and Heermann’s and (presumably) Narrow-faced K-rats.